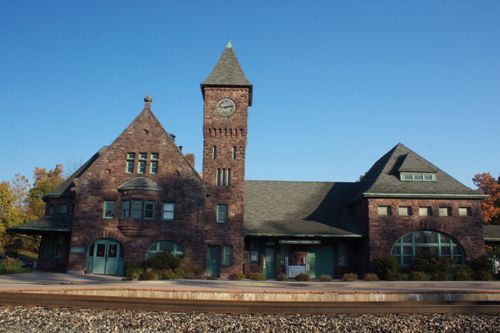 When the railroad revolutionized passenger travel in the nineteenth century, architects were forced to create from scratch a building to accommodate the train's sudden centrality in social and civic life. 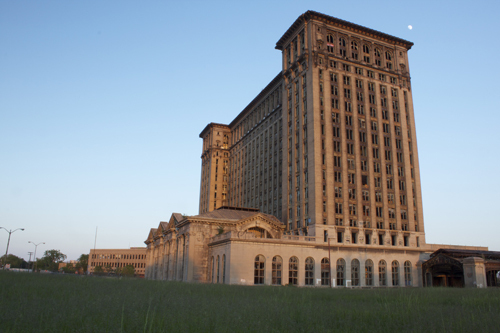 The resulting depots, particularly those built in the glory days from 1890 to 1925, epitomize the era's optimism and serve as physical anchors to both the past and the surrounding urban fabric. In Michigan's Historic Railroad Stations writer and photographer Michael H. Hodges presents depots ranging from functioning Amtrak stops (Jackson) to converted office buildings (Battle Creek) and spectacular abandoned wrecks (Saginaw and Detroit) to highlight the beauty of these iconic structures and remind readers of the key role architecture and historic preservation play in establishing an area's sense of place. Along with his striking contemporary photographs of the stations, Hodges includes historic pictures and postcards, as well as images of "look-alike" depots elsewhere in the state. 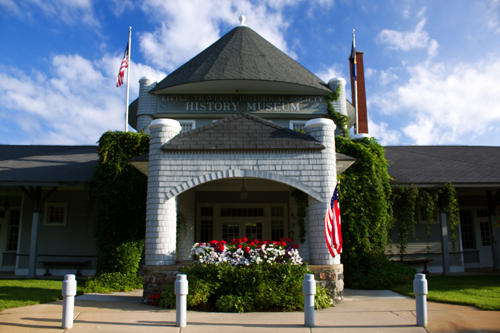 For each building Hodges provides a short history, a discussion of its architectural style, and an assessment of how the depot fits with the rest of its town or city. 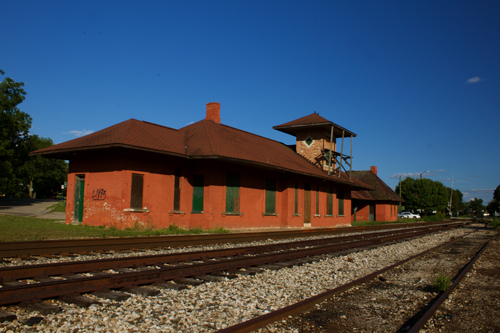 Hodges also comments on the condition of the depot and its use today. 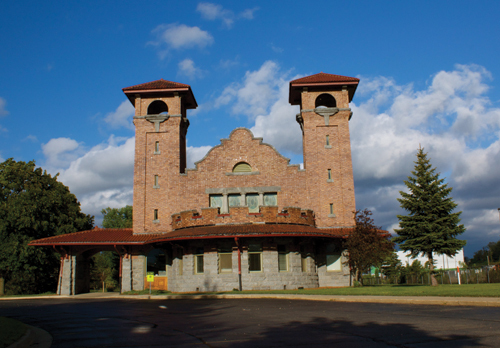 An introduction summarizes the functional and stylistic evolution of the train station in the nineteenth and twentieth centuries and surveys the most important academic works on the subject, while an epilogue considers the role of the railroad depot in creating the American historic-preservation movement. 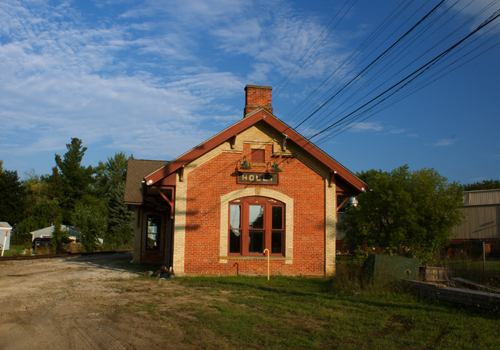 The railroad station's decline parallels a decrease in the use of public space generally in American life over the last century. 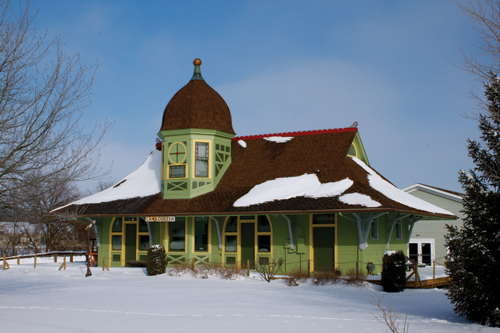 Michigan's Historic Railroad Stations will reacquaint readers with the building type that once served as the nation's principal crossroads, and the range of architectural styles it employed both to tame and exalt rail transportation. Readers interested in Michigan railroad history as well as historic preservation will not want to miss this handsome volume. Michael H. Hodges covers art and architecture for the Detroit News, where he's worked since the early 1990s. He also writes and photographs the newspaper's architecture blog. A native of the Detroit area, Hodges grew up on a dairy farm thirty miles north of the city. He confesses to being crazy about architecture, an obsession he blames on the six years he spent as a student at Cranbrook School in Bloomfield Hills, one of North America's great, idyllic campuses. Since the early-1990s, Hodges has covered art and architecture for the DETROIT NEWS, so this book likely was more a labor of love than just another writing task. 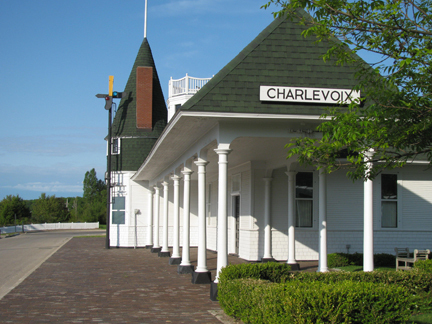 Here, the author samples 31 depots from across the state - some nicely restored like Charlevoix and others on the verge of total collapse like Saginaw, or with a questionable future like the Michigan Central depot in Detroit. He presents a wealth of information concerning architectural styles as well as excerpts from local newspaper stories for each of his depot subjects. The railroads arrival upended the individuals place in the world. Cities across the country that had been as remote as other planets-unless you could get there by boat-were suddenly and dizzyingly within reach, marvelous to contemplate even if one never actually boarded a train. The isolation of the preindustrial era, both crushing and beautiful, was erased once and for all, and humankind would never be quite the same. Here is the wonder of a world brought to life in Michael H. Hodges' photographs and essays. We rode the rails out of the past and into the future, and along the way we stopped off here, at these stations, to catch the next train. It's a memorable trip, and Hodges is a brilliant conductor. Railroad buffs will love this book, as will those who appreciate photos of interesting 19th- (and early 20th-) century architecture, Michigan history buffs and anyone who looks at a beautiful abandoned railroad depot in their town and is curious about the back story. In this thoughtful, affectionate survey, Michael Hodges catalogs a building type that characterized the energies and enthusiasms of its age-a confident period when architecture defined new languages to represent America's ascendant technological prowess.